Last years SPLA workshop with Mike Block & Hanneke Cassel was amazing event! Don’t miss this years! 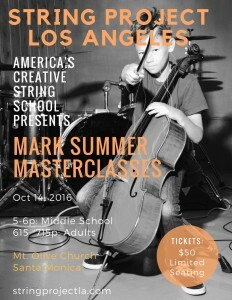 Come out to experience another Master Class like no other with Mark Summer and stay after for the Benefit Concert featuring Mark Summer, multistyle cello, Leah Zeger, gypsy Jazz Violin and Singer, Peter Lloyd, acting principal bass LACO + LA Phill Friends , Artyom Manukyan, Jazz/Hip-Hop Cello, to help raise funds for homeless UCLA students. Donations at the door. Oct 14th 8p. Both events at Mt. Olive Lutheran Church. Event has limited seating. Reserve your spot before Sept 20th. Admission: $50, please reserve your tickets here.